TORRANCE, Calif., Sept. 12 /PRNewswire/ -- Toyota Motor Marketing Europe (TMME), will unveil the all-new European-specification third-generation 2006 RAV4 compact sport utility vehicle (SUV) at a press conference tomorrow at the 2005 Frankfurt International Motor Show. "We look forward to the arrival of the new RAV4 in the U.S. later this year," said Jim Lentz, Toyota Division group vice president and general manager, Toyota Motor Sales (TMS), U.S.A., Inc. "Completely re-styled, the new RAV4 is larger and more powerful to provide the necessary utility and performance for active singles and the comfort, versatility and convenience to meet the demands of young couples with and without children." The next-generation RAV4 rides on an all-new platform that is significantly longer and wider, inside and out, with a roomier and more convenient passenger compartment than the previous generation (the U.S. version will have a longer wheelbase than the European version). With an increased length of more than 14-inches over the previous generation, a new seating design features second row seating for three and optional third row seating, a first in the small SUV segment. The seating allows for numerous seat fold-down configurations, and under-floor storage (on models without the third-row seat), providing cargo space comparable to a mid-size SUV. Among the array of interior features new to RAV4 are optitron gauges, cruise control with lever-operated brake deceleration, dual zone automatic air conditioning, audio mini-jack port, and a dual glove box. The RAV4 will offer an optional all-new class-leading 3.5-liter V6 engine with dual variable valve timing with intelligence (VVT-i) that will generate 268 horsepower, more than some V8-equipped larger SUV's. The standard powertrain will be an upgraded 2.4-liter four-cylinder engine with VVT-i. The engine will deliver 166 horsepower, making it one of the most powerful in the small SUV segment. The increased power of the two powertrains is matched with improved fuel efficiency. Like all Toyota SUV's, RAV4 will be equipped with the Toyota Star Safety System, which includes an enhanced version of Toyota's Vehicle Stability Control (VSC), Traction Control, Anti-lock brakes with Electronic Brake Force Distribution, and Brake Assist. RAV4 will also offer optional driver and front passenger seat-mounted side, and front- and second-row roll-sensing side curtain airbags. Ride and handling is significantly improved as the RAV4's new platform includes a redesigned suspension, which is coupled with a more responsive new electronic power steering system. The new Sport grade will feature standard 18-inch alloys, helping to provide enhanced performance handling. Additional Sport grade features will include overfenders, privacy glass, roof rack, and a unique interior seat fabric for a more aggressive appearance. A new Limited grade offers increased interior refinement, which includes dual zone air conditioning, power driver seat, an upgraded audio system with a six-disc CD changer, and available leather-trimmed interior seats. An all-new exterior design features a modern-rugged theme. Its contemporary look includes an aerodynamically sleek and sporty shape with a wider stance and sharp character lines that convey the power and muscularity traits commonly associated with SUV's. The all-new RAV4 will be offered in three distinct grades; Base, Sport, and Limited. Each grade will be available in two- and four-wheel-drive (4WD) with a four-speed automatic transmission on four-cylinder models and a five- speed automatic transmission with V6-equipped models. 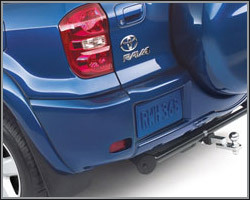 The 4WD RAV4 features Toyota's newest electronically controlled 4WD on-demand system with a manual 4WD Locking Switch. V6 (with tow prep package): 3,500 lbs. Overall Width (without/with overfenders): 71.5"/73"
Overall Height (without/with roof rack: 66.1"/68"